What is Dungeon Crawler Mod? 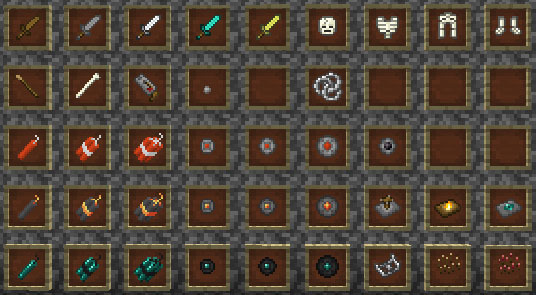 This mod uses a meager 13 item IDs for the 39 new items it adds. 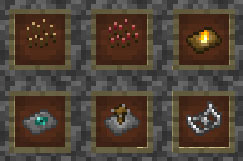 Items added include weapons, armor, weapons, traps, mines, and improvised explosives! There are also new recipes to salvage materials and make old items in new ways. There’s a properties file that currently does nothing! If you have item ID conflicts, change the other mods’ items for now! The properties file is generated in the ‘config’ folder in your .minecraft directory. More of a tool than a weapon, these are created by placing one of your material of choice on top of a stick. These are the best tools for breaking crafting tables and webs. Craft them with rotten flesh to get a raw porkchop! 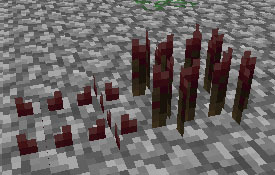 They can also be used in some crafting recipes to make them shapeless or get more/better salvaged material (see the knife section in crafting). They will eventually be throwable. Rule number one about survival: you need a knife. Can be made by crafting a stick with a knife. It’s basically a stick with the Sharpness II enchantment, but it breaks after 16 hits and cannot stack. Can be used to craft spike traps. Made by crafting a bone on another bone or by a bone with a knife. Weaker than a wooden sword, but lasts longer and is good at squishing bugs. This one is really fun in creative mode. Craft a block of gravel, get pebbles, throw pebbles. Crafting with a knife yields more pebbles. Each pebble is effectively a snowball, except it actually deals one damage (half a heart). Armor made from bones. Less protective overall than leather, but has Projectile Protection I. Want armor better than leather or bone, but only have a little iron? 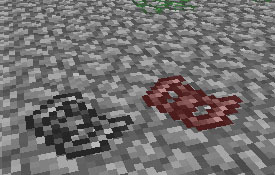 Each iron ingot can be crafted into three chain links, which can be used to craft chainmail armor. Rotten flesh and cooked meat can be smelted into leather, just make sure you don’t starve yourself! All bombs come in three sizes – small, standard, and large. Crafting two of the smaller size together makes the larger, and crafting one of the larger size makes two of the smaller. 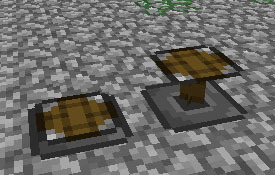 Crafting a bomb with a pressure plate on top results in the mine counterpart of the bomb. Your standard explosive. The medium size is crafted by a string above two gunpowder (like an upside-down sword). 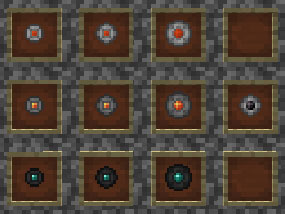 All bombs are considered improvised, but these are the only ones that get the title. These are the same as standard improvised bombs, only fiery. Crafted by a string on gunpowder on blaze powder. These (sort of) teleport entities in the blast radius. Crafted by a string on gunpowder on an ender pearl. These can be placed in the world and will detonate when hit, touched, or even just shaken a bit too hard. They can be disarmed by right-clicking them with shears or a knife. All mines have a one-time trigger effect and are then gone forever, but can be placed quickly and easily. Your standard explosive. Crafted by a pressure plate on an imp bomb of any size. 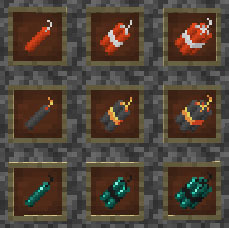 These are the same as standard improvised mines, only fiery. Crafted by a pressure plate on a fire bomb of any size. These (sort of) teleport entities in the blast radius. Crafted by a pressure plate on an end bomb of any size. These explode into a cloud of choking gas. The cloud lingers for ten seconds and, obviously, impairs vision and suffocates entities nearby. 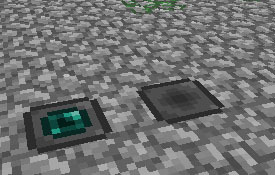 These can be placed in the world by holding down the right mouse button on a block and will trigger when walked on. They can be disarmed by right-clicking them with shears or a knife. All traps must be reset by right-clicking them (with anything) each time they are triggered before they can be triggered again. In the trap pictures, the trap on the left is set, and the trap on the right has been triggered. Your standard trap. Deals damage and gives mobs a little bump. The poison trap is a spike trap, but with poison on it! Yay? 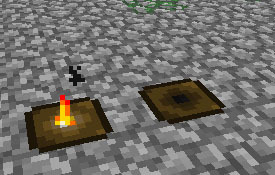 This trap sets the ground around it on fire when triggered! Known in some nations as the “piston trap”, the launcher trap throws entities into the sky! Twelve blocks into the sky, to be exact. This is obviously not what the trap will look like when it is finished. Based on a trap made for the mythical creature “bear”, the crippling trap really hurts the ankles of whatever is unlucky enough to step on it. 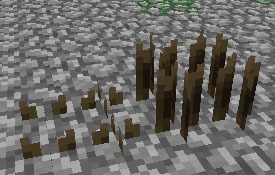 All knives, swords, axes, pickaxes, shovels, bows, arrows, arrows, torches, and fishing rods may be crafted with bones instead of sticks. Many items can now be salvaged into some of the materials used to craft them. In general, these recipes include a single ingredient. Wood and food salvage recipes (and a couple special recipes) can also optionally include a knife – this will roughly double the amount salvaged or provide different/better materials. Any cooked meat (or rotten flesh) can be smelted into leather. So you don’t have to place/break gravel a million times.